Of course, games are inherently about exploration, in the abstract sense of discovering strategies and options, seeing how rules interact and so on. And yes, you can summon screenshots of Warhammer halls bigger than the Taj Mahal, or mountain vistas in Lord of the Rings Online reminiscent of New Zealand. But a traveler's favorite moments aren't always about monuments, scenery, museums or food. Often the wanderer speaks most fondly of encounters on the road, whether with locals or fellow travelers. For me, the best of travel, its quintessence, is confrontation with the Other: societies wholly different from mine, cultures built on assumptions so divergent from my own that I hadn't realized they were assumptions. This, for me, is why playing MMOGs doesn't feel like travel. They offer too little of the Other. 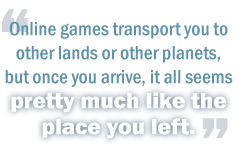 Online games transport you to other lands or other planets, but once you arrive, it all seems pretty much like the place you left. Non-player characters (NPCs) act the same way. You do pretty much the same things and kill pretty much the same creatures, though they have different animations and color schemes. In many cases this is a feature, not a bug. Sometimes the genre requires it. You want to easily navigate the worlds in Star Wars Galaxies because, Ewoks notwithstanding, the heroes usually do that in the movies. In Tolkien, one part of Eriador is much like another, and so it is in LoTRO. Your City of Heroes superhero may time-travel visit Cimerora in ancient Rome, but why bother learning Latin when that's seldom a problem in the comics? Even regardless of genre, MMOGs can safely omit much of the travel experience. Language barriers are only useful if they enforce interesting gameplay, as with the Horde and Alliance factions in World of Warcraft. Players don't want to get lost trying to find the train station, nor dodge traffic on the way there, nor figure out the schedule, change currency or watch for pickpockets. Travel presents many frustrations, and nobody wants to play them. But MMOGs omit much of the Other mainly because it's not cost effective. The work designers and artists expend on creating it is, by definition, confined to a specific area. After they get it all neat and entertaining and Other-y, they must start over from scratch to create a different kind of Otherness on a different map. And for what audience? How many players explicitly seek that experience? The best market is probably backpackers on seven-month trips, and when they can even get online, they're busy writing home asking for money. I still think, though, the experience offers clear play value. On the road, the simple challenge of getting to Point B by Time C can be exciting and, if you succeed, satisfying. Players who understand and respect a map's local cultural norms could get special missions and rewards. They would enjoy offbeat and flavorful dangers, in the same way slumming tourists pay for a simulated illegal Mexican border crossing or a trip to Chernobyl. How, then, do you create such experiences for a small audience at a reasonable cost? The answer, as with so many current web ventures, is user-generated content.